Will You Successfully Defend Your Business against Invading Spreadsheets? When we at Product Data Lake are exhibiting on trade shows (yes, we sadly are that old school, sometimes), we have a computer game called PDL Invaders. The game is built over the legendary computer game called Space Invaders. In our version, you use the PDL spaceship to shoot down invading spreadsheets and emails. The purpose of the game is to emphasize one of the main reasons of being for Product Data Lake. We want to replace the use of spreadsheets for exchanging product information in cross company supply chains with our automated cloud service. Spreadsheets is the most common tool to directly exchange product information between trading partners today. 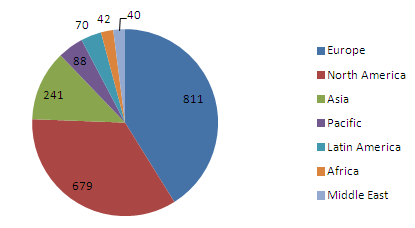 The typical scenario is that a receiver of product information, being a downstream distributor, retailer or large end user, will have a spreadsheet for each product group that is emailed to be filled by each supplier each time a new range of products is to be on-boarded (and potentially each time you need a new piece of information). As a provider of product information, being a manufacturer or upstream distributor, you will receive a different spreadsheet to be filled from each trading partner each time you are to deliver a new range of products (and potentially each time they need a new piece of information). Customer data portals is a concept a provider of product information may have, plan to have or dream about. The idea is that each downstream trading partner can go to your customer data portal, structured in your way and format, when they need product information from you. Your trading partner will then only have to deal with your customer data portal – and the crowd of other customer data portals in their supplier range. Add to that, that spreadsheets is the “natural” tool to download data from such a portal. Supplier data portals is a concept a receiver of product information may have, plan to have or dream about. The idea is that each upstream trading partner can go to your supplier data portal, structured in your way and format, when they have to deliver product information to you. Your trading partner will then only have to deal with your supplier data portal – and the heaps of other supplier data portals in their business-to-business customer range. Add to that, that spreadsheets is the “natural” tool to upload data to such a portal. Product Data Lake is the sound alternative to the above options. Hailstorms of spreadsheets does not work. Follow us on LinkedIn and get up to date information about when the PDL Invaders game will be close to you. Our company page is here. 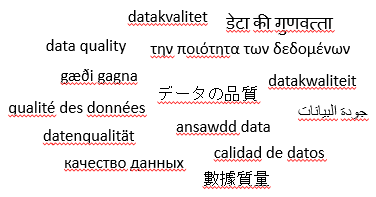 The term ”data quality” exists in many different languages. As reported in the post Häagen-Dazs Datakvalitet, the Scandinavian word for data quality is datakvalitet. Well, actually there is no such language as Scandinavian, but datakvalitet is used in Danish, Swedish and Norwegian all together. Maybe even in both Norwegian languages, though Google Translate only know of one Norwegian language. In other Germanic languages the words for data quality are close to datakvalitet. In German: Datenqualität. In Dutch: Datakwaliteit. The above terms are compound words. Even though English is also classified as a Germanic language we see a Latin influence as “data quality” is two words in English. And that goes for all English variants. It is only when it comes to if we have to standardise this or standardize that we are in trouble. British English is best when we have to select if data quality improvement is a program or a programme. In true Latin languages we have three words. French: Qualité des données. Spanish: Calidad de datos. 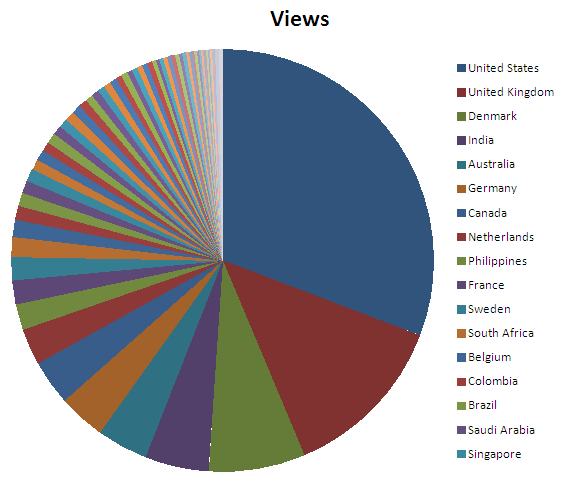 Finally wordpress.com, the hosted version of WordPress that I am using, has added geography to the stats. The counter has been running for 14 days now, so I have tried to have a first look into the numbers. Note: This figure is made by copying the results into excel. The world has certainly become a small place. Of course your interactions are biased towards your neighborhood, but in blogging as well as in business our success will increasingly become dependent on meeting, understanding and interacting with (maybe not so) strange people of the world. Spam mails can be great food for thought. The blue countries are using point as decimal mark and comma as thousand separator and the green countries are doing the opposite. Then there may be diversities within a country as in Canada there are always questions about Quebec, where they are following the French custom. India also has its own numerals with 100 groupings besides the English heritage. The pattern of a approximately one half world using one standard and approximately another half of the world using an opposite standard is seen in other notations as arranging person names, writing street addresses as well as place names and postal codes as told in the post Having the Right Element to the Left. 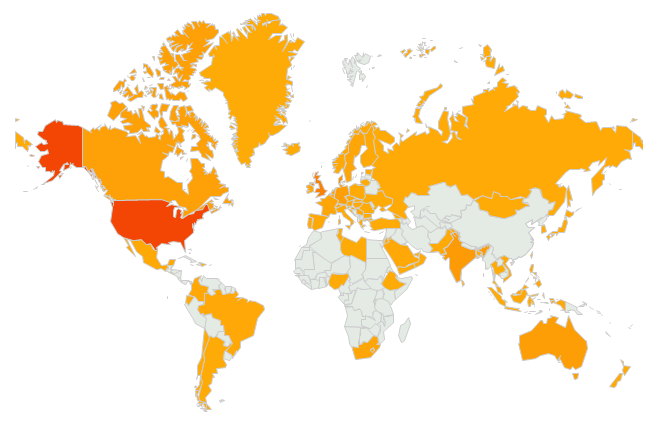 This tenth Data Quality World Tour blog post is about South Sudan, a new country born today the 9th July 2011. The term “reference data” is often used to describe small collections of data that are basically maintained outside an enterprise and being common to all organizations. A list of countries is a good example of what is reference data. Sometimes the terms “reference data” and “master data” are used interchangeable. I started a discussion on that subject on the mdm community some time ago. One problem with reference data as a country list is if you are able to keep such a list updated. A country list doesn’t change every day, but sometimes it actually does like today with South Sudan as a new country. If you have master data entities linking to reference data like a country list it is not that simple when the reference data changes. If you have a customer placed in what is South Sudan today that entity should rightfully link to Sudan regarding yesterday’s transactions, but you may also have changed the name of Sudan to North Sudan which is the continuing part of the former Sudan. We call that kind of challenge “slowly changing dimensions” but it actually looks like “suddenly changing dimensions” when we have to figure out who belongs to where at a certain time.